This big and important room is crucial to understand the revolution occurred to the traditional figurative schemes of Tuscan and Italian painting at the end of the 13th century. The majority of the works of art displayed still show the influence of Byzantine art: bodies are two-dimensional and highly stylized with sharp outlines. 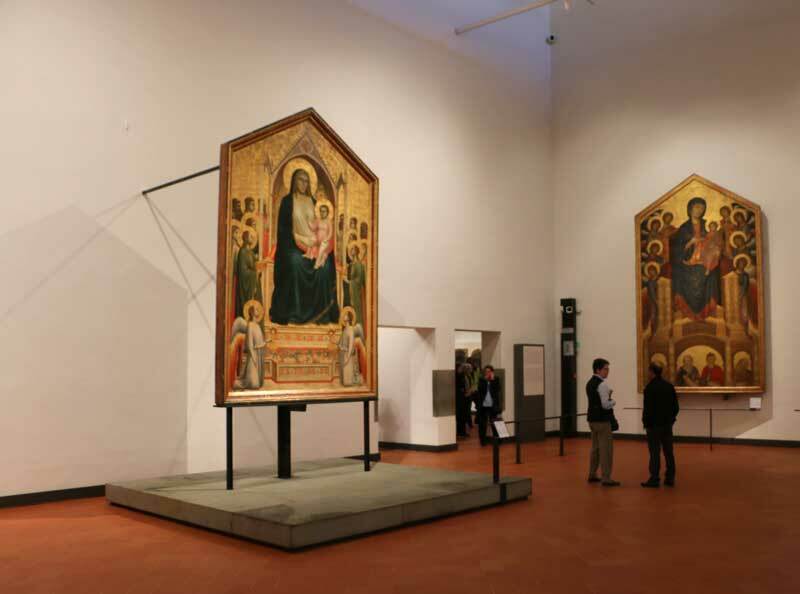 Three are the masterpieces worth lingering on: three colossal temperas on wood panels called Maestà or Majesty (a depiction of the Virgin Mary on a Throne). Their authors are three masters of 13th century Italian painting: Duccio di Buoninsegna, Cimabue and Giotto. At that time, Duccio was the most important representative of the Sienese school of painting that focused on the importance of color and decoration over drawing. His Maestà, also called the Madonna Rucellai, was painted in 1285. The Virgin sits on a marvelous inlaid throne and her face, still enigmatic like that of a Byzantine icon, is softened by the hint of a smile. The heavy decoration typical of Sienese painting of the time is visible in the golden border of Holy Mary’s garments. Cimabue is considered the last Italian artist to be influenced by Byzantine art. In his tempera on wood known as Maestà of Santa Trinita, painted between 1280 and 1290, you can witness that something is changing. The throne with its wide base where the four prophets and a mighty Madonna rests her leg on the upper step foreshadows the spatial experimentation his apprentice, Giotto, will become famous for. Giotto is the true originator of modern painting. He paved the way to the Renaissance. His Maestà, known as the Madonna di Ognissanti, painted around 1310, is completely different from Duccio’s or Cimabue’s. The Virgin sits on a throne that gives space a shape and creates a “perspective box” where figures are physical, and finally, humanized. Here, the subjects can be thought of as being real human beings, with both a real body and soul, living in a real space, this world. The hall has been fully renovated as part of the “New Uffizi” project and reopened in Spring 2015.